Late Czech intellectual who was the 1st President of the Czech Republic from 1993 to 2003. Before getting into politics he was a author and poet who also wrote more than 20 plays. He performed in several Czech stage productions in the 1960s before starting his political career. He also served as the Chairman of the Human Rights Foundation until his death and he received both he United States Presidential Medal of Freedom and the Gandhi Peace Prize. 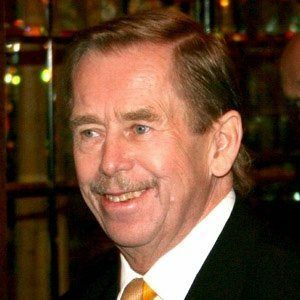 He got married to second wife, Dagmar Veskrnova in 1997, but was previously married to Olga Splichalova from 1964-1996. He was awarded the St. George Victory Order by Mikheil Saakashvili two months before his death.